We are a group of nine young people made up of Belfast Youth Forum, NI Youth Forum and Children’s Law Centre to make up the Youth Mental Health Committee. 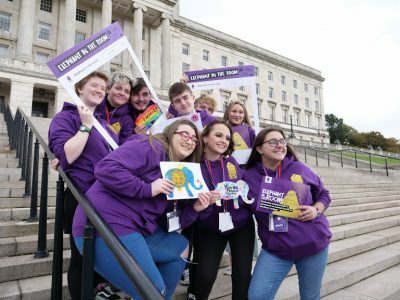 Elephant in the room is a youth-led mental health campaign which aims to reduce negative stigma surrounding mental health, improve educational resources and get funding for more support services in Northern Ireland. The idea for our campaign originated from an event that took place in October 2016 where over 100 young people expressed their frustrations at the lack of mental health education & support services available here. They called for the UNCRC’s recommendation to ‘Rigorously invest in child and adolescent mental health services in NI’ be fully implemented by our Government. To help make this happen, young people at the event asked us to begin work on creating a mental health research campaign. Following this we as a group of young people came up with the idea for Elephant in the Room.